It is effective against fleas, ticks and lice and acts by affecting the parasite's nervous system. Fipronil inhibits the down-regulation of nervous activity by blocking the action of a receptor called GABA, which is involved with inhibiting nervous stimulation. Fipronil blocks chloride ions from entering cells, so they are unable to bind with the receptor to 'switch it on'. This means that without any down-regulation of the nervous system, all the nerves fire at will and the insect goes into a state of hyper-excitement. 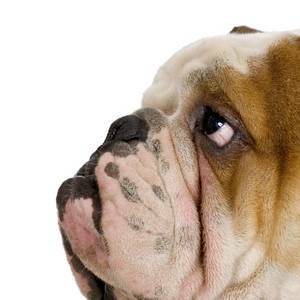 Fleas become hyper-stimulated, causing them to spring to the top of the pet's fur in a spasm, and dying soon after. Fipronil kills adult fleas but it is reported to have some larvicidal effects too. The fleas do not have to bite the host animal for it to take effect, as it works via contact and by ingestion. Methoprene is another chemical combined with fipronil in Frontline Plus. It is a juvenile hormone analogue, meaning that it mimics the activity of the juvenile hormone, a substance which keeps the fleas "young". When this chemical is introduced directly to flea larvae or into their environment, larvae are prevented from completing the metamorphosis into adults and subsequently die. In addition, methoprene also has ovicidal and embryocidal effects when applied to female fleas. Note that Frontline Plus for Cats and Kittens contains a higher concentration of (s)-methoprene when compared with the canine versions of the product. Frontline Plus and Top Spot are transported around the body of the treated pet within 24 hours of being applied. They are carried in the skin's oil layer and are deposited into the skin's sebaceous (oil) glands so they continue to release the product for the entire month of treatment. In addition the product is sprayed all over the body. Frontline kills 98 to 100 per cent of existing adult fleas in less than 24 hours. It can remain effective against fleas for up to six weeks in cats and three months in dogs. However, monthly application is recommended to ensure that other parasites are controlled adequately. In addition to killing adult fleas, Frontline's methoprene component is effective against both larvae and eggs, thus breaking the life cycle at several points to ensure good environmental flea control. This inhibition of flea development is said to ensure little or no potential for re-infestation on dogs for 12 weeks and cats for six weeks. As the product localizes in the hair and outer layer of the skin, it will also be shed with fur into the areas where the animal spends the most time and which, therefore, are likely to have the highest concentration of larvae. 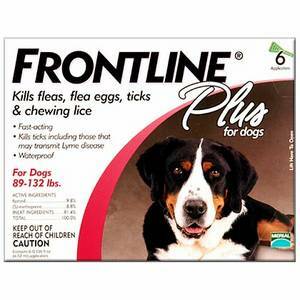 "Frontline kills 98 to 100 per cent of existing adult fleas in less than 24 hours. It can remain effective against fleas for up to six weeks in cats and three months in dogs." Frontline is registered to kill all four common US ticks, namely Brown Dog Ticks, American Dog Ticks, Lone Star Ticks and Deer Ticks, for at least one month. However it may take up to 48 hours to kill the ticks on dogs. Manufacturer Merial advises that you inspect your animals on a daily basis if you live in a high-risk tick area, as 48 hours may be sufficient for transmission of some tick-borne diseases. Frontline continues to work even after your pet is bathed or goes swimming, due to its deposition in the sebaceous glands,. However it should only be applied when the animal is dry. Animals should not be bathed for 24 to 48 hours after Frontline application to allow the product to be transported around the body and settle into the glands. From then on bathing, swimming or exposure to sunlight will not affect the product's efficacy. Frontline is also registered for the rapid elimination of chewing lice. Repeat treatments should be applied monthly. Frontline also aids in the control of sarcoptic mange on dogs. When applied externally, Frontline is only minimally absorbed into your pet's body so toxicity or poisoning after normal application is unlikely. The compound is more selective for the nervous receptors of insects than those of mammals. "Individual sensitivities, while rare, may occur after using any pesticide product. Pets may experience temporary irritation at the site of product application. If signs persist, or become more severe within a few days of application, consult a veterinarian immediately." This skin irritation can manifest as hair loss, redness, or itching in the area where the product was applied. On rare occasions pet owners have also complained of skin reactions. If animals lick the product, its bitter taste is likely to trigger hyper-salivation. Frontline spot-ons can be used safely in breeding, pregnant and lactating cats and dogs, however the spray has no such claim. All formulations may be used in puppies and kittens from eight weeks of age. Fipronil is very toxic to rabbits and should under no circumstances be used in this species as it can result in death. The spot-on formulations are applied once per month to the skin of dry (not wet) animals in a single spot between the shoulder blades. The spray should be applied wearing latex household gloves with the bottle held in an upright position. The pet's coat should be ruffled with one hand to expose the skin, while applying the spray to the back, sides, stomach, legs, shoulders and neck of the pet until the hair is damp to wet. For the head and eye area, it is recommended that the product be sprayed onto a gloved hand and rubbed gently into the pet's fur. Approximately one to two pumps per pound of body weight is the normal application volume, although pets with long coats may require the higher rate. Owners are advised to wash their hands and exposed skin thoroughly with soap and water after applying the spray. Please consult your veterinarian to discuss the most appropriate flea or tick control for your pet. Frontline Plus, Frontline Top Spot, Frontline Spray Labels, Merial Ltd, Duluth Ga.
Frontline? and TopSpot? are registered trademarks of Merial.